It’s hard to beat these warm September days! We hope you got to be out and enjoy them. The veggies sure love it too. It looks like some cooler days are coming this week, but the plants have some good momentum so they’ll keep growing a couple days after the cool sets in. This delays the let-down of letting go of the warmth, and the funny thing is once they keep growing and/or ripening for a couple days we get a little delusional and excited that they’ll just keep growing even through the cold! Well, last week was full of excitement around here. The harvest was big and delicious, the Eat Local Challenge and the voting involved was touching and exciting, and we had a successful closing on the new land purchase. And we just learned yesterday that were one of the Midwest winners for the Bon Appetit Fork to Farm grants! Holy cow, thank you all, and the students, staff and faculty, and the staff at Minnesota’s Bon Appetit locations, for all the kindness and enthusiasm. And for making the effort to vote for us! Since the Eat Local Challenge day we have been stunned in humility and gratitude, and now hearing we got the grant too….we’ve had tears in our eyes and all we can do is bow and be thankful for the opportunity to grow food and serve you all. If you’re wondering what this grant thing is all about (because we buried it in the middle of the last newsletter), click here for info on the grant program, and here for info about the Midwest finalists, including us. We’ll use the $5,000 to help offset some of the costs of our soon-to-be-built root storage facility, specifically a forklift, a couple conveyors and some large bins. The new root storage will basically be an addition to the barn, on the north side out the back door. (Young children, and your caretakers — yes, the sandbox and trikes will have a new home.) It won’t be underground much, so we can’t quite call it a “root cellar”, but that’s essentially what it is. But a more modern version of the bunker-in-the-basement — it will have capacity for over 100,000 pounds of root crops, it will be very well-insulated and actively cooled with outside air, with the air and moisture content monitored and controlled by computer. On a scale of Western agriculture it is still small, but on a small farm like ours, selling the food to be eaten in our community, it will have a big impact. The root storage will enable us to provide carrots, beets, parsnips and other such roots through March — to the co-op and to foodservice suppliers, mainly Bon Appetit in their various eateries at colleges and private companies, and more. We are also weighing the pros and cons of also doing a winter CSA share, with pickups once a month through the winter. That would involve growing more of several different crops, and having the proper storage on the farm for them, to provide more variety for your share. So at the moment we are focusing on root crops for wholesale, to specialize a little bit and take advantage of the some of the efficiencies in specialization. We’ll see how it goes having more going on in the winter! We’re glad to hear your thoughts on all this, now and over time. We’ve been cooking up these plans for the last year or two, and we’ve been fortunate that the financing has been worked out through loans with the Farm Service Agency. But since the land purchase happened this year too, and we’ve also got other investments to make in the farm, the Bon Appetit grant will give a little breathing room in the cash flow. It’s a relief to have some help to make it through this phase of big investments in the farm, to make it even more of a community asset. So where’s this land we keep talking about? In short, it’s 15 acres east of our driveway, all the way to Highway 3. You can now call us the organic veggie farm at the corner of Hwy 3 and 320th St! The north boundary is a line extending east from the north edge of “our woods”, about 400 feet north of the barn. This includes the fields we’ve been renting, where you’ve been picking green beans, cherry tomatoes etc. Aside from being the proud owners of a lot more debt, this means we now “own” 25 acres, and rent another 3. We don’t expect to expand the CSA very much, if at all, but the extra land will help us grow more of those root crops for storage, and be able to rest land in soil-building cover crops. And it will give us the option, if we choose later on, of growing more winter crops for a winter share, or experimenting with more grains, growing our own cover crop seed, and/or some more fruit. We’ll see what the years hold. Vegetables take a lot of nutrition out of the soil to give it to you, and our need to cultivate to keep down the weeds is hard on the soil too, so a soil-building year for each field every few years should help with plant health and keeping yields high. Many thanks to the Frame family — Mary Ellen, William and Sandy, and David and Clare — for being willing to sell us this productive field to grow more good food on it, and entrusting us to keep it healthy and productive for the next generations. Alright, that’s enough about us. No more news around here. We wish you a happy fall, and thank you for all your kindness and support. Let’s eat! Having made it through the first patchy frost a few weeks ago without any real losses, this warm weather has been a veggie farmer’s dream come true. And, we hope you’ll agree, a veggie-lover’s dream too! 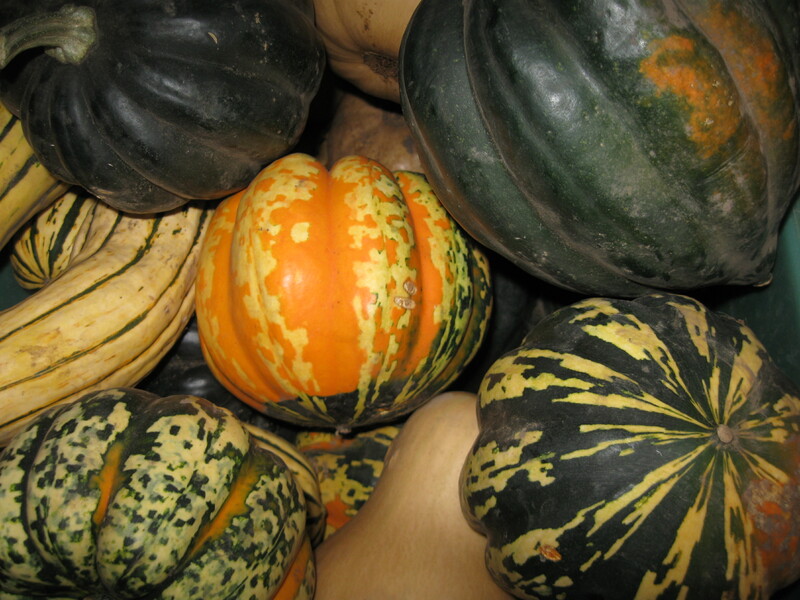 Winter squash is here and ready to eat! This week we’ll choose the best butternuts we can find to mix in with the acorn, carnival and spaghetti squashes and pie pumpkins. Butternuts are a great all-around squash, for roasting, adding into stir-fries or curries or soups, and are also great for a smooth and creamy “pumpkin” pie. In our kitchen we roast squashes of all types, and eat them on the side of almost any main meal, or add them to pasta dishes, quesadillas (with red peppers and spinach!) — you name it and you may well find a winner by adding squash. It’s also not uncommon for one of us (usually Ben) to eat half a squash, warm out of the oven, while standing at the counter. When we need to use up any squash that’s been sitting in the fridge, we’ll often warm it in a pan on the stovetop, with a little butter and chopped sage, and if it still needs help, a lil maple syrup. We’ll have Butternut squash the rest of the fall — it’s the best keeper and most versatile. The acorn and carnival don’t hold as well, we’ll try to use them up in the next 2-3 weeks, spaghetti in 1-2 weeks. The ambercup and buttercup should be ready in a week or two. The delicata didn’t yield well, but there should be enough to have a few around this week and next. This week, and for a couple more, you’ll get to take home at least two squashes in your share. If it’s too much squash, remember to eat the smaller ones first and save the bigger ones. Squash freeze well too — roasting gives the most flavor, but boiling cubed squash works too. If it’s still too much squash, give them away! This is a bounty of the season that you get to reap, having taken the risks of the farming season with us. Sweet potatoes we’ll put out some dirty and some clean — the dirty ones store a little better if you want to stock up a few. Broccoli is back. Everything else goes on — carrots, beets, celeriac, celery, onions, cabbage and napa cabbage, peppers, cauliflower, and a few straggling tomatoes. Peppers and tomatoes will slow down next week if the cool forecast comes true. Salad greens, lettuce and spinach are on track to feed us all of October. The lettuce might fall prey to some “rot” — the drier weather the better. We heard and saw some kale fatigue — the chard did rebound so we’ve been picking that too. Raspberries have surpassed our expectations this year. Looks the warm weather might just ripen every single one, until the plants run out of fruit. Please watch for bees on the berries, they are eating in there too since flower sources are few at this time of year. They have been willing to share, they’re just a little touchy when surprised or squished by your picking fingers. Cherry tomatoes are ripening slowly, and will slow down even more now. Nearing the end. Green beans have a little left on them, we will keep them open until they freeze. Herbs and flowers will trek on to the frost, some ragged but still going. Some will survive frosts — oregano, thyme, sage and parsley. Always check the U-pick board when you’re here to see what’s available and picking amounts, and feel free to come anytime dawn to dusk to pick, and enjoy the farm. This week’s selection is : Lettuce Mix and/or other Salad Greens for $5 / lb, Spinach $4 / lb, Carrots, Beets and Celeriac for $1 / lb, Kale for $3.50 / lb, Cabbage for $0.70 / lb, maybe Green Bell Peppers or Red Peppers $2 / lb, Garlic $1 / head. Tomato boxes will be hit or miss as ripening fluctuates with the temps, feel free to check with us. A deposit of $10, or the full amount, by Oct 24th will hold your spot. For a price, we believe $90 is fair for all of us. In general, this year’s storage share will be similar to the last five years’, varying according to this year’s yields. It is separate from the regular season share, a one-time pickup in November before Thanksgiving, and we hope it looks something like this: a big bag of super sweet fall carrots (our goal is 20 lbs), a smaller bag of mixed fall roots, 3-5 squash, +/- 10 lb potatoes, +/- 5 lb sweet potatoes, Brussels sprouts, garlic, onions and leeks, kale and maybe cabbage. For dried herbs, a selection of thyme, sage, oregano and rosemary. Potatoes and sweet potatoes we haven’t finished harvesting yet but from digging a few forkfuls and rows, yields seem to be ample. Cabbage is ahead of schedule but there should be enough left; brussels sprouts, cabbage and kale are cold-hardy but if we get January cold in early November then they might be in short supply. Everything else is certain as certain can be in an uncertain world. All for $90, a fair and reasonable price for all of us. We provide info and inspiration on eating and storing all that goodness too! The picture below is most of one storage share. Let us know if you have any thoughts on it or questions about it, we’re happy to answer questions. If there’s any part of it you won’t be interested in having, just let us know on the pickup day and we’ll donate it to the food shelf. We love providing this food for you, we hope you enjoy cooking and eating it! This week we will start handing out renewal letters for next year. In all the hubbub the last two weeks we forgot to get them ready. Deposits or full payments can be given to us in the barn or mailed in. There’s lots of 2014 left still but we like to give you plenty of time to plan — it’s easier for us to do sign-ups this year, too. The letter will have more details. As always we encourage your feedback, thoughts, questions etc and look forward to another year with you! The Sogn Valley Craft Fair is this weekend — Saturday from 10am- 5pm, Sunday from 10am- 4pm. This fair is a great fall tradition with great artists and craftspeople, plus some food and music. Even if this isn’t usually your kind of thing, it’s a sweet way to spend part of a fall day. You’ll probably see people you know, wandering around or selling their goods. You’ll see us selling veggies if you go on Saturday, as they’ve always had a farm theme, and like to have fresh organic produce plus pumpkins and dent corn, honey from the beekeepers that keep our bees (Homestead Apiary), jams and other canned goods to keep the farm connection. There’s a pottery studio to tour (in an old granary), plus fascinating blown glass, paintings, photos, metalworks, wood carving, puzzles, jewelry, toys — on a farm in Cannon Falls, it’s a great place to wander, and shop for gifts. The website is www.sognvalleyartfair.com, the street address is 35200 County 24 Boulevard, and we have postcards in the barn with a map and directions. Thank you for U-pick containers — and Keep Them Coming! Last share pickups are Monday Oct. 27th and Wednesday Oct. 29th, with no pickup that Friday. To free us up for big final harvests, we ask that Friday folks come on Monday or Wednesday of that week (just for that week.) Look for details on signing up for a day in the next newsletter. If you can’t make it here the 27th or 29th please check with us later in October and we’ll make arrangements to set it aside for you to pick up when it works for you. Please Drive Carefully and Slowly on the Driveway —Children are everywhere. On the note of children, please know where yours are at all times. Thank you so much for eating in the ups and downs of what we can harvest on this growing farm!! Named for its long, thin strands of noodlelike flesh, spaghetti squash is a good alternative to pasta, potatoes, or rice. Plus, it’s easy to prepare and tastes great with just a drizzle of olive oil, salt, and pepper. This creamy red pepper sauce highlights the sweetness of the squash. SQUASH: Preheat an oven to 400°. Cut the squash in half lengthwise and scoop out the seeds. Place the squash halves in a baking dish, cut side up; drizzle with olive oil and sprinkle with salt and pepper. Cover and bake until the skin is easily pierced with a fork, 30-40 minutes. Let cool, then remove the strands of flesh with a fork. RED PEPPER CREAM: Preheat a broiler. Place the bell pepper halves cut side down on an aluminum foil-lined baking sheet and lightly coat them with olive oil. Grill under the broiled until the skin is blackened and the flesh has softened slightly, about 8 minutes. Place the peppers in a paper bag, a resealable plastic bag, or ceramic bowl covered with a plate to cool for about 45 minutes (this process will help loosen the skin). Remove the skin from the peppers and cut the peppers into small pieces. In a skillet, cook and stir the garlic, basil, and peppers in the olive oil over medium heat for 10 minutes. Place the mixture in a blender and puree to the desired consistency. Return the puree to the skillet and reheat to a boil. Reduce the heat and stir in the half-and-half an cheese; simmer, stirring, until the cheese melts. Add the butter and stir until melted. Season with salt and pepper. Simmer for a few minutes more. Serve ladled over the spaghetti squash. Heat 2 Tbsp of the oil in a large skillet over low heat. Add the garlic, saute for 1 minute. Add the cauliflower and sprinkle with 1 scant teaspoon of salt. Turn up the heat to medium-high and saute for 5 minutes. Add 3 Tbsp of water to the skillet, cover, and cook for 5 minutes more. Stir in the tomato puree, parsley, and thyme; bring to a simmer, and cook for 15 minutes, stirring occasionally. Season with pepper to taste. Cook the pasta according to the package directions. Drain. Transfer the pasta to a large bowl. Pour the cauliflower sauce over the pasta and toss to coat. Stir in the remaining oil and the butter, cheeses, and basil; toss until everything is well combined. Garnish with more Parmesan cheese if you desire. Serve hot.